Von der Analytik über die Molekularbiologie bis hin zur Kooperation mit dem Botanischen Garten: Die Methodenvielfalt der Arbeitsgruppe "Biochemische Ökologie und Molekulare Evolution" bietet Studierenden umfassende Möglichkeiten in der Forschung. Im Rahmen Ihrer Bachelor- oder Masterarbeit und natürlich Ihrer Promotion haben Sie die Möglichkeit, Ihre Methodenkenntnisse und –kompetenz erheblich zu erweitern. Durch die Anwendung und Optimierung verschiedenster Methoden aus den Bereichen Biochemie, Molekularbiologie, Naturstoffanalytik, Zellkulturtechnik, Mikroskopie und Bioinformatik vermittelt unsere Arbeitsgruppe dabei auch die wichtige Fähigkeit, interdisziplinär zu arbeiten – und eigene Stärken und Schwächen kennenzulernen. Plant tissue culture provides living plants throughout the whole year – independent of the winter period here in Kiel with limited sunshine. Furthermore, this technique allows the continuous cultivation of species, which show an annual life cycle in nature. Beside whole plants, also individual plant organs, e.g. roots, can be grown separately. 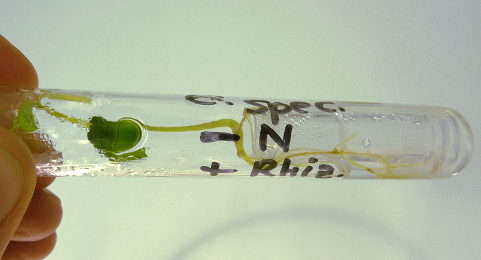 Such plant organ cultures can be used to study biosynthetic pathways, which are restricted to the respective plant organ. To identify genes that are involved in the biosynthesis of pyrrolizidine alkaloids a range of molecular methods is required. These methods can also be used to study the evolution of specific genes, their expressional pattern and the regulatory mechanisms responsible for expression. Routinely, we isolate nucleic acids from diverse plant species and tissues, apply various PCR-based methods, clone and heterologously express proteins in E. coli and other host organisms. We study the genes that we identified also on protein level. For example, we are interested in the functions of the encoded proteins and how this functions changed over evolutionary time. For these functional studies, we use diverse methods of protein purification, starting with classic purification from plant material up to affinity tag based purification. The purified proteins are then characterized in enzyme activity tests. To localize enzymes that are involved in pyrrolizidine alkaloid biosynthesis we are using antibodies conjugated to fluorescent dyes. Binding of these antibodies on cross-sections of specific plant organs will be detected using a fluorescence microscope. Additionally, the method of “laser capture microdissection” allows to isolate individual cells from cross-sections under the microscope by using a laser beam. Subsequently, the separated cells can be further studied with various methods. Our research projects require the identification, detection, and quantification of natural products, with a focus on pyrrolizidine alkaloids. For this purpose, we are using methods like TLC, HPLC coupled with DAD detection, GC and GC-MS. By collaboration we also have access to LC-MS.
Bioinformatic methods allow analyses of evolutionary changes at DNA level. These methods include phylogenetic reconstruction of gene evolution and also analyses of the selective pressure that has acted in the past on specific genes. Furthermore, to exploit sequence data provided by “next generation sequencing” (e.g. illumina sequencing), bioinformatic methods are used in our group.